NOAA and DOCARE officers have copies of the video as well as photographs of the boat the man was riding on. The carcass, first spotted more than a week ago, was towed out, 15 miles into the open ocean last Saturday after landing on rocks at Sand Island State Recreation Area. Over the last few days southerly currents have again brought it closer to land. 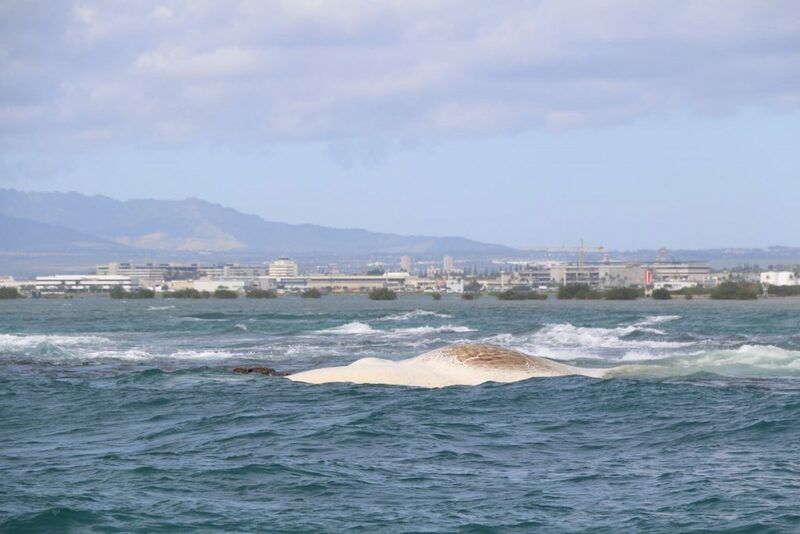 It is now resting on a reef off O‘ahu’s south shore. DOCARE, NOAA, biologists from the DLNR Division of Aquatic Resources (DAR) and the University of Hawai‘i Mammal Stranding Team, assessed the carcass today and determined any attempt to tow it was not feasible because of unsafe sea conditions. They’ll try to tow it again once calmer seas return. They remind anyone tempted to touch the whale or remove any of the remains could face federal and state charges that could mean hefty fines and jail time.